Last year, RunCam announced a new GoPro Session alike camera, which was shortly withdrawn from the US market due to some patent infringement. Curiously, this new RunCam 3S features also similar cubic design but it has straight lines instead of rounded lines. Not a big change, so I hope that will last more on the market compared to its predecessor. While the first generation RunCam 3 was powered by a built-in 960mAh Li-Po, the RC 3S adopts a 850 mAh removable battery. When it is used as drone camera, the RunCam 3S can be powered directly from the drone’s main battery in order to reduce the total weight of the aircraft. The RC 3S camera measures 40 x 38 x 36mm and weights about 69 grams (~3g heavier than its predecessor). In front of the the 160° lens there is a Corning Gorilla 3 protector glass. On back of the camera there is a micro USB connector, battery level indicator and WiFi button. Power button is located on top off the camera. Micro SD card slot is located behind the battery flap. According to the camera’s user manual, Class 10/UHS-I/UHS-II/UHS-III memory cards are accepted with capacity of up to 64GB. Through the RunCam APP you can fine tune the camera’s settings. You can turn ON/OFF WDR and also start/stop video recording. RunCam 3S Price: How much will the new RunCam camera cost? 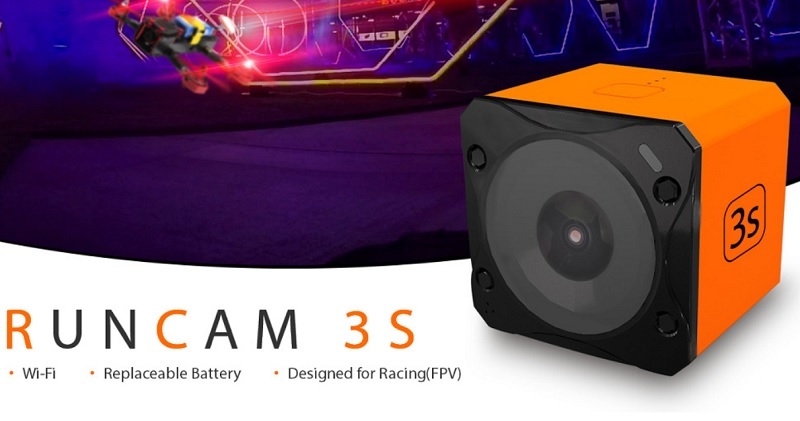 Using this “ZMWYJRKM” coupon code you can pre-order the RunCam 3S camera from GeekBuying for only $96.99. The price includes cables and one battery. There are multiple shipping methods available, including free one. For EU orders I suggest to use “EU Priority Line”, it is duty-free for European Union countries.